This week’s Friday Night Action tournament was dominated by the seemingly unstoppable Koganov family. In the top swiss, Mikhail Koganov entered the tournament seeded third but went 3-0 defeating top seeds NMs Ian Harris and Daniel Lowinger along the way. 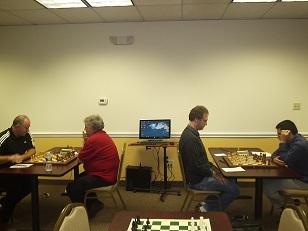 Koganov’s impressive performance gained him over 30 rating points and propelled him over 2200! Meanwhile, the younger Leo Koganov was busy winning his match against Al Pinto. The pair played three games. 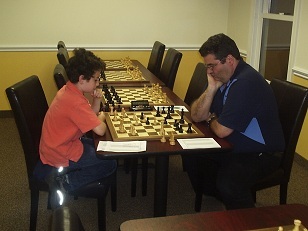 Leo also won his first two games and seemed on track to also go 3-0, but Pinto managed to strike back in the final game to make the score 2 – 1 in favor of Leo. Collectively the Koganovs scored an impressive 5/6. Leo also gained over 30 points and is now just two points shy of crossing 1000!